In her refreshingly blunt New York Times bestseller You Are a Badass , Jen Sincero served up hilariously inspiring stories, sage advice, and the occasional swear word, all with the goal of helping readers reverse self-sabotaging behaviours and create a life they love. 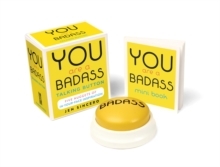 You will love this badass kit, which includes an 88-page mini abridgement of Sincero's irreverent guide and a Badass Button for your desk, kitchen, or bedroom that spouts inspiring messages in Sincero's own voice. It's the perfect anytime reminder that You are a badass!"